Jacqueline Huston has no idea what has been happening to her, but it started the night she was attacked by men with strange powers. While wounded in the attack, Jacqueline knows she would have surely died if her husband hadn't thrown himself into the line of fire. But being alive is little comfort when your husband is dead. Ever since that night, Jacqueline has been strangely attracted to death for reasons she doesn't understand. When death is nearby, she experiences the uncanny feeling that she can predict when it is coming for someone. However, it's the weird urge to sing when she gets close to dying people that disturbs her the most. Toby Williams is a wizard and a member of the Brotherhood of Merlyn, an ancient order of wizards. He's been charged by the Brotherhood to keep an eye on Jacqueline Huston. After all, half banshees are rare, and if placed in the wrong hands, they can be a powerful weapon. As owner of Merlyn's Bar, a place the lovely Ms. Huston frequents, it seems an easy enough assignment for Toby. When sinister Derek Spark attempts to kidnap her, Jacqueline learns a frightening truth--she comes descended from an old Irish family whose women are destined to become banshees upon their deaths. Jacqueline was meant to die in the attack a year ago, but because she was only wounded, her banshee genes are coming out, making her a powerful weapon to those in the supernatural world. Derek wants to use her soul reaping powers for his own evil plans. Jacqueline must discover the truth about her heritage and save Toby, the man she finds herself falling in love with, and from her own banshee urge to reap his soul. More and more, I find myself being drawn to the paranormal and fantasy sections when it comes to review books. Perhaps it's because I keep finding books like this one. 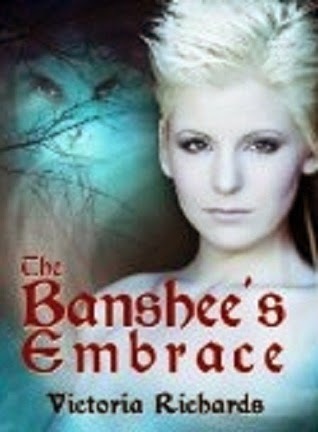 For a while, it seemed like a lot of the books were just repeats of each other, but in The Banshee's Embrace, I found an entirely new take on the old lore of banshees and wizards. On top of that, there were some twists and turns along the way that I certainly wasn't expecting and at the end of the book, I was left eagerly awaiting the next segment to find out what happens with not only Jacqueline, but her best friend, Toby, his mother and some of the other characters. Each character had their own defined personality and fit like a puzzle piece made specifically for this story. Honestly, if you enjoy paranormal/fantasy books, I recommend that you check this one out. Ms. Richards has done a wonderful job with making something old new again.